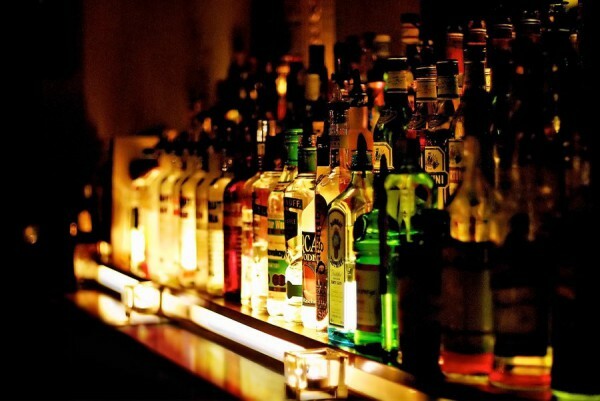 For a list of all liquor applications including the current status please click here! It is the aim of the Melville Residents’ Association (MRA) to inform all residents & businesses of all liquor licence applications made for premises in Melville and immediate suburbs. The objective is to allow Melville Residents & Businesses to make informed decisions to possibly object to, or not object the issuing of a liquor licence. It is important to note that if there is no objection lodged, it would be deemed that the application for the liquor licence is acceptable. In terms of the MRA’s practice, all liquor licence applications will be objected to in order to have the opportunity to engage with the applicant. It should be noted that the MRA have the option to withdraw their objection at any stage should it be deemed appropriate. the possible impact it might have on the community (in particular the residents, other businesses and how it might encroach on the residential area) be it inappropriate behaviour, loud music in contravention of the allocated time allowed in a licence and the recommendation of the MRA. Generally acceptable times in terms of the relevant bylaws for loud music would be Sunday to Thursday till 22:00 and Friday & Saturday till 00:00. The MRA will engage with the applicant/licence holder to ensure that the licence may not be transferred to a new vendor without notification to the MRA in order to prevent a new premises auto-transferring the old licence to the new operator with alternative arrangements or licence types. Melville currently has insufficient parking infrastructure to support the businesses and additional liquor licences would add additional pressure on existing (lack of) infrastructure. All new liquor licence applications should adhere to the relevant bylaws when it comes to noise levels in a residential area. Continual failing to adhere might result in an application by the MRA for the suspension or withdrawal of a liquor licence. Applications or intentions to apply for a liquor licence are gazetted every first Wednesday of the month unless otherwise specified in the Provincial Gazette. The MRA can only oppose a liquor licence once an actual application is received. The Gazette is published on 4 August with an intention to apply; the MRA cannot object at this time. The application is only received on 6 August which now leaves 21 calendar daysfor the MRA to take action as indicated above and the community to consider and decide whether or not to oppose the application. It is important to note that in the event that no application is received by a specific date (as per the Gazette) the intention will be withdrawn. Generally, notices are published on the first Wednesday of the month with the application due to be submitted within 2 calendar days. The closing time is 15:00 sharp. Please note that licences for temporary/occasional licences do not get published in the Gazette but MRA will when we are aware of it, attempt to ensure that the licence be issued only if supported by MRA. Taverns and Shebeens are not required to apply to Liquor Board but direct to the chief inspector. Any member of the public, associations, any municipality, South African Police Service or government institution or department may within 21 calendar days from the date of the notice of application, lodge an objection regarding the granting of a licence in the prescribed form at the offices of the Board in duplicate. Upon receipt of the notice to apply or intend to apply for a liquor licence, the MRA will determine if the full application is received or whether just an intention to submit a liquor licence. This can be determined by contacting Gauteng Liquor Board via phone or email. On confirmation of the application received, there is a 21 calendar day period in which to object. The MRA aims to advise the Melville Community of the application within 10 days and advise the date of submission of an objection should they so wish. The MRA will publish the Gazette and supporting documents in respect of the application on its website and send communication on all social media platforms. The Liquor Board requires a single copy of the objection, however, to confirm receipt it would be prudent to take a 2nd copy with to the Liquor Board and have both copies stamped as received. The 2nd copy is your confirmation that the Liquor Board has received your objection. A 2nd copy needs to be sent to the agent/attorney representing the applicant which is the responsibility of every objector. The MRA is not involved in this regard. 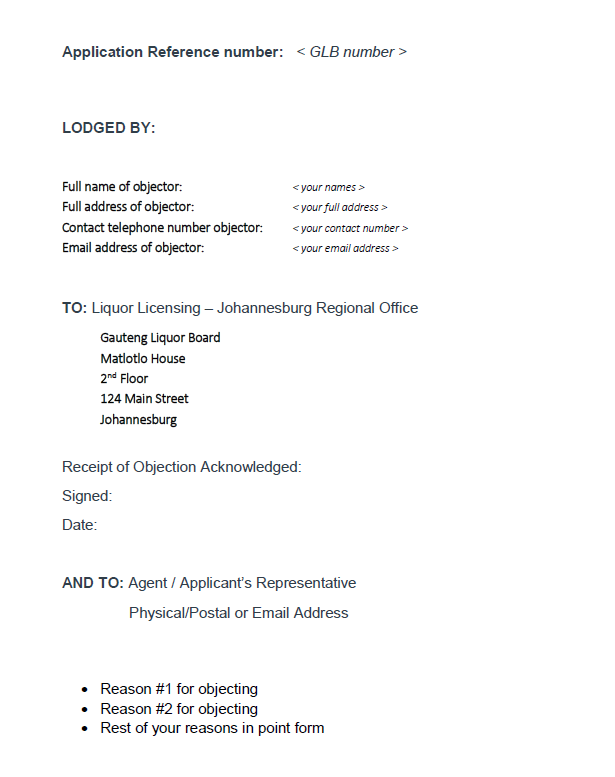 Objections must be hand delivered to the Liquor Board at 124 Main Street, Johannesburg. The MRA Committee, where possible, will assist residents to submit their objections. Details of the process will be communicated with the communication of each objection. In addition a copy of the objection MUST be forwarded to the agent of the applicant dealing with the application which can either be hand delivered or emailed direct to the said agent. Please note that an objection cannot be directed to the MRA. to the Melville Community together with the reasons for doing so. It is still to the prerogative of each and every member of the Melville community to decide whether they want to continue with their objection or not. There will be no prejudice or pressure from the MRA Committee’s side in this regard. The Liquor Board will advise if the objection is successful or not. have to attend. Objectors will be advised of the date and the requirement to appear by in person or with their representatives.